The same liberal media that has been bitterly whining about their First Amendment right of a free press for the last week, claiming that is somehow endangered because rally attendees screamed #CNNSUCKS at them, are now celebrating the decision by Facebook to permanently remove Alex Jones and InfoWars pages from their platform on the same day that Apple has removed the entire library for five of Infowars' six podcasts from its iTunes and Podcast apps. I don't care if one agrees with Alex Jones or disagrees with him, if they love him or hate him, this coordinated attack against him and his InfoWars broadcasts and social media presence should severely concern everybody that sees the abusive liberal media bias and uses Independent Media to find information the establishment media won't report. In The Friends of Voltaire, Evelyn Beatrice Hall wrote the phrase: "I disapprove of what you say, but I will defend to the death your right to say it," to illustrate Voltaire's beliefs. Jones and his Infowars podcasts and website had an extensive reach, and it matters not that sometimes I agree with him, sometimes I do not, we must all stand up for his First Amendment right to free speech and free press, whether we agree or not, because this coordinated effort to completely silence him online is just their next step in an all out war against Independent Media. After the 2016 election, where Independent Media bypassed the "official narrative" (Hillary Clinton must win) and helped prevent that fate for America, the attacks started. Washington Post helped push the disinformation campaign which listed 200+ Independent Media websites as "Russian propaganda," as others added many of those same sites to "fake news" lists, alongside of actual hoax websites. Then big tech started downranking search engine results, making sure the liberal media received the first pages of searches to limit the visibility of Independent Media sites, the exceptions being liberal bloggers. Then Google's YouTube started demonetizing video creators work, if it didn't comply with the liberal media narrative. Then revenue streams started paying less for the same amount of impressions, basically using the lower paying advertisers on sites they wanted to limit revenue to. Then social media started shadow banning conservatives, suspending their accounts, limiting the visibility of their posts. Liberals started campaigns of online harassment against advertisers that had ads on Breitbart, Infowars and other conservative news outlets. The coordinated attacks against Independent Media had but one goal..... to silence our voices. Make no mistake, this coordinated takedown of Jones and Infowars by big tech is because of his huge audience. According to Arstechnica, Jones had 2.4 million YouTube subscribers and 1.6 million followers on Facebook. Paul Joseph Watson has a message for other Independent Media, the same message we are handing out right now with this article: "For conservative media outlets who don’t speak out because they don’t like Infowars, we have a message for you – you’re next." That is not hyperbole, that is not exaggeration, that is the truth. If they can silence Alex Jones online, with his vast resources, they can, and will, eventually silence us all. Just this weekend, Candace Owens, an African America who is the communications director for Turning Point USA, a conservative, was suspended from Twitter after she copied the same anti-white racist tweets from made by Sarah Jeong, the recent New York Times hire, and Owens replaced the word "white" with "black" and Jewish. Jeong was never suspended and her racists tweets are still up on the site, but Owens was suspended for violating community standards. After a massive backlash against Twitter and it's CEO Jack Dorsey, they removed the suspension and apologized, claiming it was an "error." The censorship of conservatives has become so blatant that House Majority Leader Kevin McCarthy wants Twitter CEO Jack Dorsey to testify before Congress about the issue. The problem is congress moves too slowly and these attempts by big tech to silence conservatives is a direct attempt to meddle in the midterm elections by silencing any and all prominent conservatives across all social media platforms. That is also collusion. There are some in the Independent Media that consider others as some type of competition, but the Internet is a huge, vast place, with room enough for all of us. Every single Independent Media website should be standing for Alex Jones and Infowars today, because tomorrow, we will all be Alex Jones. Wikileaks apparently agrees as they just issued a statement regarding the purge of Infowars, saying "The empire strikes back: Apple, Spotify, Facebook and Google/Youtube all purge Infowars/Alex Jones. Yes, Infowars has frequent nonsense, but also a state power critique. Which publisher in the world with millions of subscribers is next to be wiped out for cultural transgression?" Ben Shapiro over at Daily Wire, most definitely not a Jones' fan, and who has often criticized Infowars, and been criticized by Infowars, is also speaking out about why big tech is "dead wrong," for what they are doing because there is "no definition of hate speech that has a limiting principle." 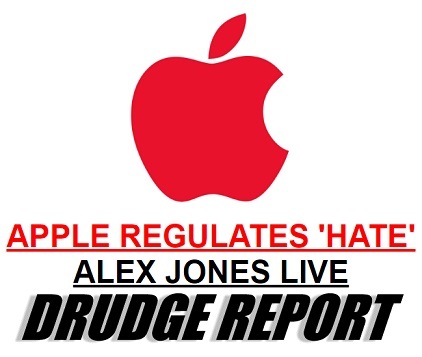 Matt Drudge of the Drudge Report makes his own type of statement in support of Jones and against big tech's attempts to silence him, by providing a direct link to the Infowars live broadcast. This purge has happened over the last 24 hours, so we do expect to see many, many more Independent Media sites stand up and speak out. 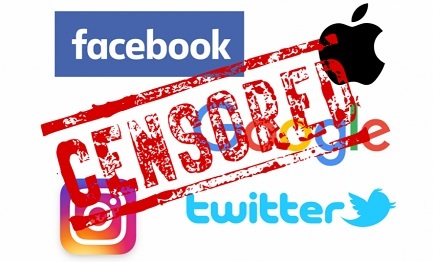 Today is a terrifying day for free speech online, a day to remember that the media, liberals, social media giants and big tech, are determined to silence conservative voices in the Independent Media and they aren't even being subtle about it anymore. Today they came for Infowars..... Tomorrow we will all be Alex Jones. 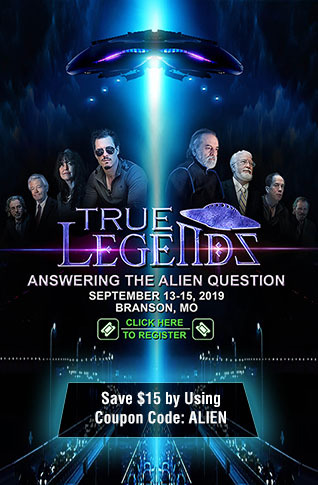 Note from Susan: This might be a good day to sign up to our ANP Newsletter. If anything ever happens to the website, we can then communicate with readers as how to access our articles. (We send 2-3 newsletters out a week, and no sponsored advertisements, so you won't get spammed.) Just as a reminder, we do have backups of the entire website and alternate measures in place in case of a coordinated attack.